The airport was known as Honolulu International Airport for almost 70 years before being re-named after Hawaii U.S. Senator and Medal of Honor recipient Daniel K. Inouye in 2017. Don’t worry, people will still know what you mean when you call it by its former name, especially since it remains the only major commercial airport on the island (the acronym remained “HNL” as well). The airport itself is certainly unique, containing open-air walkways between terminals and lushly landscaped areas full of native tropical plants and flowers for travelers to enjoy. As the primary gateway to the Hawaiian islands, more than 20 million visitors are passing through this airport every year. It’s the only international airport in the state, so any traveler coming from a country outside of the United States comes through HNL. This includes visitors who are on their way to the other islands, so don’t expect to find a direct flight from Japan to Maui. The 4,520 acres of area covered by the airport include three terminals and four active runways, one of which was the first major offshore runway to be built in the world. In Terminal 1 you’ll find the hub for Hawaiian Airlines inter island and mainland flights. Terminal 2 is home to all other airlines and international flights. The smaller Terminal 3 is confined to the ground floor, and currently only houses inter island commuter Mokulele Airlines. Passengers arrive on the second level for Terminals 1 and 2, and on the ground floor for Terminal 3. After deplaning you’ll see signs directing you towards baggage claim and ground transportation. Baggage claims will be on the ground floor for all terminals, but there are stairs, elevators and escalators to help get you there. No matter where you’re coming from (even other parts of the United States), flight attendants will bring out an agricultural declaration form for you to sign before you land. Since Hawaii’s ecosystem is unique to the rest of the U.S., the state is free of most agricultural diseases and pests (including rabies and snakes). Therefore any plants, animals or agricultural materials must be declared. That means bringing your pets to Hawaii warrants a mandatory quarantine before release. 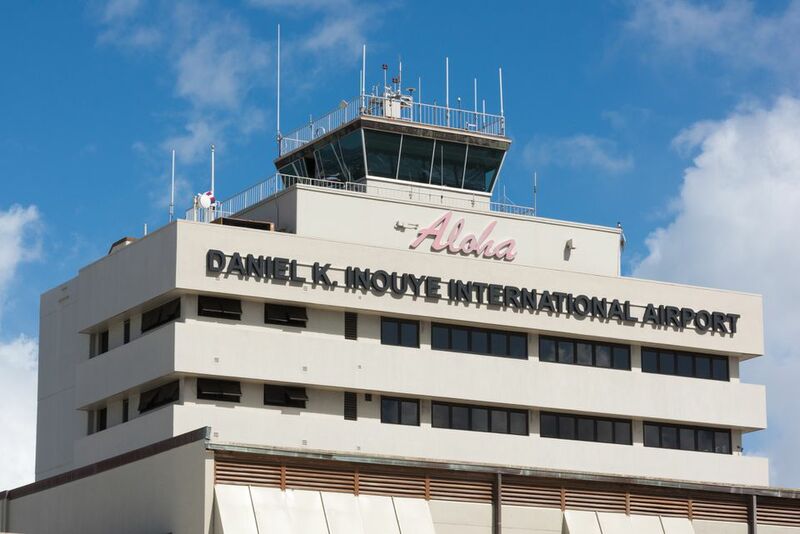 Daniel K. Inouye Airport provides free Wiki Wiki Shuttle transportation between terminals from 4 a.m. to 10:30 p.m. daily. Pickup for the Wiki Wiki Shuttle is every 15-20 minutes and pickup spots are located gates C-G in Terminal 2. All parking garages at the airport are open 24 hours a day/seven days a week and have a 30-day parking limit. There are three parking garage options for HNL visitors, and it’s important to pick the right one so you don’t end up walking too far or getting lost on your way to the proper terminal. Parking rates can be found here. The International Parking Garage is just across from the International Arrivals Building. You can access the garage by car from the ground level of the Airport Access Road or use the vehicle bridge from the top floor of Terminal 1 (handy if either lot is full). After parking, walk to International Arrivals or Terminal 2 from the ground level of the structure, or head across the walkway on the 6th level of the structure to Terminal 1. The Terminal 2 Parking Garage is across from Terminal 2. You can enter the garage from the second level of the Airport Access Road across from lobby 5. There are walkways to Terminal 2 from the fourth level of the parking structure from three different points (on either end and in the middle). The Terminal 1 Parking Garage is across from Terminal 1, and can be accessed by car from both the ground and second levels of the Airport Access Road. There are airport off-ramps from the H-1 freeway both eastbound and westbound. From Nimitz Highway, turn right at Rodgers Blvd. for eastbound and left for westbound. All exits out of the airport, including from the parking garages, have direct access to the H-1 Freeway eastbound and Nimitz Highway westbound. Traffic on Oahu is notoriously bad, so give yourself extra time when driving during rush hours. The public city bus, TheBus, routes 19, 20 and 31 all provide access to the airport. Bus stops are located on the roadway center median on the second level. You can also use Roberts Express Shuttle, with ticket counters and pickup locations outside of Terminals 1 and 2. For ridesharing apps, there are specific pickup locations on the second floor; one outside Terminal 1 Lobby 2 and another outside Terminal 2 Lobby 8. There are taxi services available from the center median outside of each terminal baggage claim areas with designated “taxi dispatchers” to assist you. If you’re near Terminal 2 by the C gates, you can have a sit down meal at Gordon Biersch or grab-and-go at A Shack 4 Eva. Also in the central part of Terminal 2, there are fast-food options like Burger King and Chow Mein Express. Terminal 2 by the G gates has a local micro-brewery called Island Brews if you’d like to grab one last Hawaiian beer before your flight. Just outside of the F gates you’ll find Jose Cuervo Tequileria with Mexican food and margaritas. For another grab-and-go option, there’s an E Komo Mai snack shack by the B gates in Terminal 1. If you’re craving a sweet treat, head to the Cold Stone Creamery or Honolulu Cookie Company in Terminal 2 by the E gates. You’ll find duty free shops in the main section of Terminal 2, and even more near the C gates. There are six Best Buy Express kiosks throughout the airport open 24 hours-a-day in case you forgot your headphones. To bring packaged Hawaiian food back home, stop at Hawaii Market in Terminal 2 by the E gates. There is free Wi-Fi available in both Terminals 1 and 2, with an option to purchase faster speeds through Boingo. There are computer work/charging stations across from Gate F2 and E3 in Terminal 2, and near B5, A15 and A19 in Terminal 1. Welcoming visitors to the islands with a lei is a time-honored tradition in Hawaii. Lei makers have sold their flower leis at the airport in Honolulu since the 1940’s, and 12 stands still remain today. You find them on the left side of the airport entry road right before Terminal 1 open from 6 a.m. to 10 p.m.
HNL has five different business centers available where visitors can rent computer time, print documents, send mail or faxes, and even purchase office supplies. A list of business center locations can be found here. Daniel K. Inouye runs an environmental sustainability initiative called SustainableHNL. Members of the military and their families have access to the USO Military Lounge near baggage claims E and F.
If you’ve got some extra time before (or after) your flight, check out the Terminal 2 Cultural Gardens surrounding the ticketing lobby and E gates. Stone pathways and bridges connect three landscaped gardens with the native flora of Japan, China and Hawaii. It’s the perfect way to escape the hustle-and-bustle of the airport. Which Airline Should I Take to Hawaii?